BYU Sports According to Tasha: Bronco is Leaving BYU for Virginia... So Who Will Be the New BYU Football Coach? Bronco is Leaving BYU for Virginia... So Who Will Be the New BYU Football Coach? 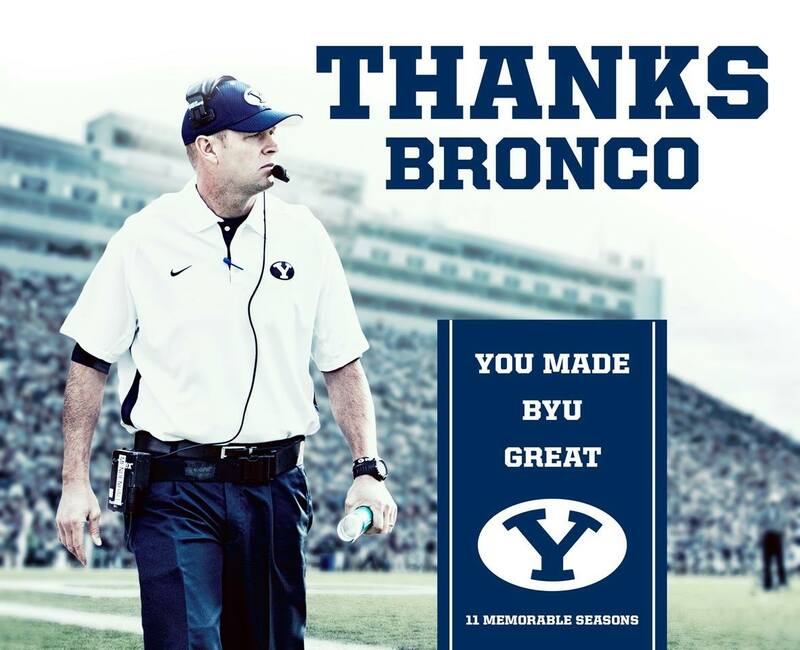 I'm still in shock from yesterday's news that Bronco is leaving BYU for the head coaching job at Virginia. Not to be sacrilegious, but I feel similar to the way I felt when President Hinckley died. 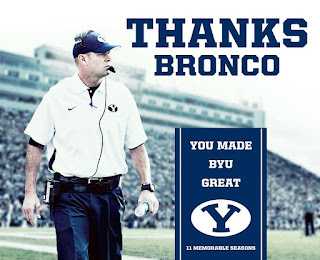 I've only been a BYU fan since 2004-ish, so Bronco is the only coach I've ever known! I guess I must have missed something because I thought Bronco was fully committed to BYU and would be with us until he retired from football. I must have been living in a hole to not know that he's said several times before that someday he wanted to coach somewhere else... I'm totally baffled by the whole thing. As much as I hate the fact that Bronco is leaving, I'm more worried about the aftershocks spreading to other members of the staff and current and future players. Is Taysom going to transfer to Virginia now? What about Jamaal? What about recruits coming in over the next few years? What members of the staff is Bronco going to take with him? Gah, my head is still spinning! But of course, the most important thing and the question highest in everyone's minds is, who is going to be the new coach at BYU? Kyle Whittingham- Please no. Please no, no, no. I know he played at BYU. But I don't like him and I don't trust him. I could totally see him coaching BYU just long enough to sabotage their game against Utah, and then quitting and going back to Salt Lake with a smug smile on his face. I can't believe any true BYU fan would actually want him to coach our team... y'all are crazy. Robert Anae- Bad idea. His performance as offensive coodinator has been a roller coaster at best. Um, didn't he get fired a few years ago? Pretty sure there was a good reason for that... I also don't think he has the personality or the "bedside manner" that's necessary for a head coach to have. Plus, he'd have a much larger role with speaking to the media, and that would just be a disaster-- he's the opposite of eloquent, sensible, or even appropriate. Most of the time, he comes across as downright rude when speaking with the media, which would not be good for BYU's image. Kalani Sitaki- Now to the decent options. I admit I'd never heard Kalani Sitaki's name before yesterday, but from my new limited knowledge, I think he'd be pretty good. As the current defensive coordinator at Oregon State, it sounds like he'd be similar to Bronco in football philosophy. He seems to be the most popular option among BYU fans from what I've heard & seen. And rumor has it that he has expressed interest in coming to BYU at some point... so there's a really good chance he'd be interested & invested in making it work. Ken Niumatalolo- Continuing in the interest of full disclosure, almost everything I know about Niumatalolo I learned from "Meet the Mormons", but I think he's my first choice right now. Assuming he is similar to the way he was portrayed in the movie, I think he'd be a great fit for BYU. He can be tough, but he's also smart and sensible. Plus, his son is already on the BYU football team. I think he'd be a great choice. Maybe we could even have Niumatalolo as head coach and bring on Sitaki as DC. I like that idea most of all.